Rabac, a small town, on the east coast of Istria, gets quite busy during the summer. Rabac has lots of little bars and cafes, as well as restaurants. Rabac is a typical touristy village, perfect for families with small children and senior citizens. If you are looking for nice beaches and crystal clear sea, swimming and sunbathing and other fun under the sun, evening promenades, ice cream and boat excursions, Rabac should be fine choice for your holidays in Istria. This resort town is set below high rising mountain, and its shingle beaches are perhaps the nicest in all Istria. Unfortunately, Rabac location feels a bit of a dead end, and to reach any other place from Rabac is kind of far. You need to take that curvy, mountainous road each time. It's not the most beautiful town in Istria, but it is a good place to spend a summer holidays, especially if you enjoy sea, and look for a low-key beach town. Town highlights are a seaside promenade lined with souvenir stands, ice cream parlors, and beach bars. An electric train runs along the promenade connecting resorts on both side of the town with the centre. Rabac gets crowded during the summer. Rabac is located on the east coast of Istria. This small resort village is set at foothills of Labin. Rabac is hilly, with somewhat untypical geography, unseen anywhere else in Istria. The mountains rise steeply up from the sea level, and houses are all built on a hill. Two things ensure: spectacular views, and uphill walks. Below you'll find Rabac map. Use + and – to zoom in and out. Rabac is a small village with good tourist infrastructure, but also very seasonal demand. Tourists visit Rabac for town's lovely beaches. Thus, the best time to visit Rabac is from June through September. Don't forget that Rabac is a small village, with just over 1.000 inhabitants, but it features over 10 hotels, tourist resorts, a campsite, and many private apartments to rent. It has enough beds to accommodate over 10.000 tourists in a single day. This means that the town, and its beautiful beaches, get crowded, particularly in July and August. If you are a family with school-age children, then you'll have the best time visiting Rabac in July and August. There are lots of entertainment options, and organised activities in the town, and resorts for all ages. However, if you travel as a couple, June and especially September are much better months to travel to Rabac. The accommodations prices are more affordable, the village is less crowded, while the weather is still great and the sea is warm enough to swim in. Beaches in Rabac are the best in all Istria. While elsewhere in Istria the coast is mostly rocky, and pebbly beaches are more often than not artifical, Rabac offers numerous natural, wonderful pebbly beaches. Seriously, guys, beaches here are as nice as beaches along Makarska Riviera (and you don't need to travel that south to experience them). Rabac is a perfect spot for family vacation, either with children or in a couple. Rabac is safe, tourist infrastructure is excellent, and all hotels & resorts are within walking distance to the center of a village, and many bars, cafes, and restaurants. As of 2017, Valamar Hotels & Resorts, Croatian largest hotel chain, has two new resorts in Rabac: TUI Family life Bellevue Resort, with a ton of activities, and facilities for families with kids, and Girandella Adults Only rooms & suits. Rabac is set at foothills offering ample opportunities for hiking and chasing wonderful vistas. The start from the village itself, up to Labin, can seem tough at first, and can leave many inexperienced hikers out of breath. However, you can bypass this part with a car. As for the rest, the region around Rabac & Labin offers as many as 11 hiking trails and paths of different difficulty level. If you are an experienced hiker you can join one of many trekking events taking place in Rabac throughout a year: IstraTrek in March (Croatian only), Long Walk Day in April, International Walk Day in October. Rabac & Labin are also starting point of the longest Croatian ultra-trail race, 100 miles of Istria, taking place every April. The uphill challenge from Rabac to Labin is only for experienced cyclists. However, the area around Labin offers close 5 marked cycling trails of different lenght and dificulty level. The shortest trail, Bella Vista, is 33 km long, and as it name suggests, the trail offers beautiful views. Allegro hotel Rabac is official bike hotel securing safe bike storage, repair tools, and bike washing service. This small resort town is all about swimming, beach hopping, and water activities, but also it's popular hiking and mountain biking destination. Mountains of Ucka and Cicarija aren't that far away, and so are a couple of small waterfalls, like Sopot, and Gologoricki Dol. Hiking Skitaca (or even just driving for those who don't feel like hiking) will award you with wonderful vistas over east coast of Istria, Kvarner Bay, and islands of Cres & Losinj. We've already mentioned that beaches in Rabac are awesome. And they alone are reason enough to visit this Istrian seaside town. From Girandella, Lanterna, and Maslinica beach, all in town, all pebbly and wonderful, to little gems in surrounding villages, like Ravni, Sv. Marina, and Klancac Beach near Brsec, beaches in Rabac will take your breath away. Add to that crystal clear turqoise Adriatic Sea, great underwater visibilty, variety of water sports on offer, and you have a winning formula for a perfect beach holidays in Croatia. The only down side: beaches in Rabac do get crowded in summer. We love to taste authentic local food wherever we travel. In fact we often choose our destination in Croatia or elsewhere based on quality of food on offer. And, if food is important part of your travel experience than Istria is THE place to visit in Croatia. And Rabac is no exemption. OK, to be completely correct, not exactly Rabac, but nearby Labin, and other surrounding villages. We love Velo Cafe, located at Labin's main square, and Peteani (ex. Riva) in a recently open hotel of the same name. We also eat occasionally in Dorina in Plomin when we ferl like having a good old Istrian fare. Before our favorite restaurant in the area used to be Martin Pescador in Trget. Sadly, the place changed the owner, and it has been a spiral down ever since. We still love its location, right at the seafront, at this rundown fishing village. Read our full post on best restaurants in Rabac. Labin is one of many hilltop towns in Istria. But it's also has its own unique vibe, and story. Labin used to be its own republic, although its independency was short-lived. Very short indeed – only one month, from March to April 1921. People from Labin have their own distinct dialect, sometimes incomprehensible even to people from other parts of Istria. Labin is a medieval town with lots of historical buildings from that time. But Labin has also been a mining town. You can witness this part of town's history in Labin City Museum that features 150 m long mining tunnel. Hike, bike, or simply get in a car, and wonder around in a search of beautiful vistas. During long winters, when our little region, gets voided of all visitors, and most of places shot down, we spend weekends exploring lesser known parts. Last winter we took a road from Trget, across Skitaca (the highest point in Labin region), through Ravni, and then to Labin. Views are great! One of the best olive oil producer in Istria, Croatia, but also ia all world, Diulio Belic, comes from Rabac. If you are interested in olive oil tasting, learning about real olive oil, we highly recommend stopping by Belic tasting room. It's right in Rabac, so you won't need a car to get there. (Although it's almost on the top of the village, and you'll need to walk uphill.). Belic produces 11 different mono-sort olive oils, and one bland, called Selection. You can read our full post on olive oil tasting at Belic (it's bit outdated as it was one of the first blog posts we've ever written back in 2011, but it still gives you a feel of what to expect; Belic has extended his tasting room since then). Read our full post on things to do in Rabac. Rabac is actually a little resort town without historical or cultural sites to visit. Before the first hotels were built, and tourists started flocking, Rabac wan nothing but a fishing port, and a summer refuge for people of Labin. Labin, on the other hand, is a medieval hilltop town, with rich history, and few sites worth visiting. Surrounded by town walls, the old part of Labin features several interesting buildings and palaces from middle ages, tiny cobble streets, town loggia, once a centre of Labin public life, and few museums. Teatrino, or small theatre, opened in Labin in 1844, in a former granary. The building itself dates from 1539. Theatre is today run by Italian Society, and it still hosts various shows throughout the year. The theatre is located at Labin's main square, just steps away from town's main gate – Port San Fior. The building is one of the most photographed motive from Labin. And it's often mistaken for a church, because it features a bell tower with a clock. Medieval town of Labin has many interesting Baroque palaces including Francovich, Mazini, Negri, and Battiala Lazzarini Palace. Today, Labin's city museum is housed in Battiala Lazzarini Palace. The museum showcases the history of Labin through the collection of artefacts, and monuments. The museum also features ethnographical exhibition including various tools, handmade crafts, traditional costumes, and alike. But for me, the real attraction here is a 150-meter long mine tunnel. You get a helmet, and you can enter the tunnel where various tools and equipment simulate the real mine tunnel. Another interesting building is Francovich Palace, dating back to 17th century. The Francovich palace is a home to a museum dedicated to Matthias Flacius Illyricus, a protestant, writer, philosopher and historian who lived in 16th century. His legacy includes over 200 books. Just few kilometres from Labin, you can visit Dubrova Sculpture Park, a large outdoor exhibition featuring more than 70 sculptures. The entrance to the park is free. Istria is the best destination in Croatia for foodies, no doubt about that. 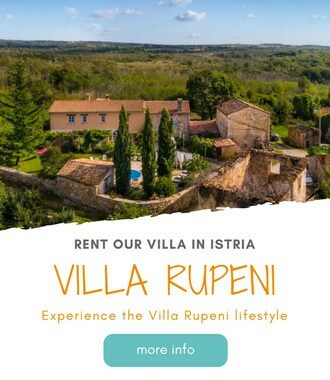 And as you would find out if and when you visit Istria, the best restaurants aren't always in popular coastal towns, and resorts. But, rather in the off-the-beaten path locations, scattered all over Istria. And Rabac is not different. Food in Rabac is similar to food in other Istrian towns, with few local specialties like pasutice (a diamond-shaped pasta), and krafi (sweet ravioli stuffed with cottage cheese, raisins and lemon zest). 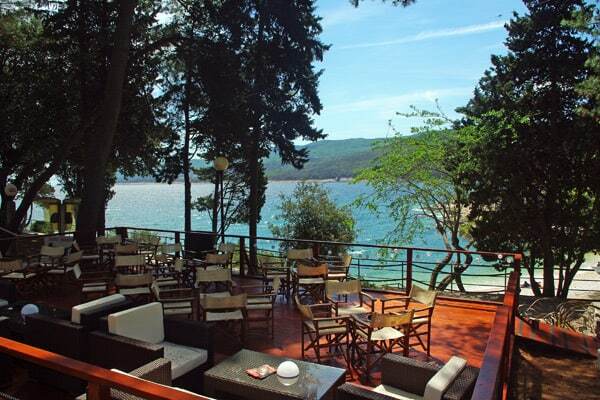 In Rabac you'll find over a dozen of restaurants, mainly aligned along the seafront promenade. Majority of them offer a simple touristy dishes like fried calamari, grilled fish or meat, pasta and pizza. While there are some decent restaurants in Rabac, our favourite places are few kilometres away from Rabac. So, if you are just looking for a decent meal in a nice setting, we recommend trattoria La Pentola. There are also a couple of new restaurants within Valamar resort, like Craft Beer & Grill, and Balck & Blue Steakhouse. But they are pretty new, and while they sound promising enough, we are still to taste their food in order to report back here. For a light lunch in establishments that advertise tourist menus, you'll pay between 6 and 8 €, while the main dishes, like steaks or fish, go for 20 €. A scoop of ice cream is around 1 €, as much as a cup of an espresso coffee. You can eat cheap in the local bakeries (but we don't recommend you do this for a long time, 'cause your stomach won't feel right after so much white flour and fat). A popular phyllo dough cheese or meat pie will set you back 1.5 €, and you'll be good to go until the dinner. However, to eat really good in Rabac, you'll need to get out of town. Run by Valamar Hotels & Resorts, a largest Croatian hotel chain, La Pentola serves a good choice of pasta, pizza and other quick bites, like fish & chips, calamari, lamb chops, and beef cuts. The setting is lovely, with large outdoor terrace, and modern and clean furniture. Prices range from 45 Kn for a plate of pasta, to 135 Kn for a tuna or a beef steak. Service can be slow, and not always great, but it's still a decent place to eat in Rabac (if you don't feel to drive). A lovely cafe-restaurant located at Labin's main square, Velo cafe is one of locals' favourite places to eat in Labin. The place is rather large and consists of a ground floor cafe with a nice outdoor terrace; konoba, a cozy eatery with a fireplace in the basement; and an elegant restaurant at the first floor also with a nice outdoor terrace for dining al fresco. Food is regional, prepared in a traditional way, but sometimes with a modern twist. The menu is extensive, it changes with a season, and everything is tasty. Another real gem in Labin, Peteani is located in a family-run hotel of the same name. The same family used to run a restaurant Riva in Plomin Luka, but moved it to Labin once they opened their boutique hotel in Labin (back in 2016). We loved eating at Riva, and we love even more eating in Peteani. While the food is pretty much the same (and so is the staff), the interior, and the atmosphere is so much nicer. If you like a seafood prepared to perfection and served with elegance, then don't miss a meal at Peteani while in Rabac. Restaurant Due Fratelli is situated in a village Montozi, close to Labin. Due Fratelli serves indigenous Istrian cuisine: home-made pasta with meat and fish stews, polenta, etc. Their fish is also of an excellent quality as the owners have their own fishing boat. the restaurant has a nice, shaded terrace. Perfectly located, right at the seafront, this is an ultimate cocktail bar to visit during your stay here. The Beat has a raised seating area where you can sip a cocktail, watch the world go by and listen to music ranging from local favourites to smooth jazz. Prices are reasonable. Thematic nights with live concerts and DJs, amazing cocktails and after beach parties are popular at this hip bar. Open from April to October, shaded outdoor terrace attracts beach-goers during the day, and party-goers at nighttime. Two major hotel companies operate here: Maslenica hotels, Italian owned company, and Valamar Hotels & Resorts. Maslenica hotels, we wouldn't recommend, except for the price (you can get a quiet good deal on these hotels). Valamar Sanfior Hotel is a four-star hotel in Rabac featuring 150 rooms, an outdoor and indoor swimming pool, small wellness area and nice courtyard terrace. Many rooms have french window, so Frank would highly recommend to ask for a ground floor room as they have nice terraces. Valamar Bellevue Hotel & Residence is a family hotel with 174 rooms. Standard rooms are quiet small (18 m2), so Frank would recommend you to ask for Twin with an extra sofa bed as they are bigger in size (21 m2), or just opt for the suites that are located next to the hotel, in the detached villas. Hotel has an activity and entertainment program for children and adults. There is an outdoor swimming pool. Campsite Oliva is the only campsite in the town. Campsite Olive is not one of the best campsites in Istria, but it is the only one in Rabac. So if camping is your way of vacationing, you can stay in campsite Oliva. The beach is nice. The capacity is 1.700 people. Beside camping plots, there are 150 mobile homes to rent available. Hotel Villa Annette is a small family run hotel with 12 suites. It is situated on the top of a cliff and it overlooks sea and Rabac harbor. Rooms are large with sleeping and sitting area and each of them having a large balcony with stunning sea views. Rabac Vacation Rentals can be a really good choice for your vacation in Rabac. Rabac offers a good choice of vacation rentals, some of the properties are at the very seafront. If you like to enjoy an authentic experience of living like the locals, you appreciate all the comforts of home even while on vacation, and if you are in search for international standards of comfort at the lowest cost, renting an apartment can be a way to go. Frank's favorite place to stay in Rabac is Casa M. Casa M offers one-bedroom apartments to rent with an excellent view over the sea. And beside that, they are Frank's friends and amazing hosts. If you are looking for the apartment in Rabac, stay there. No doubts!